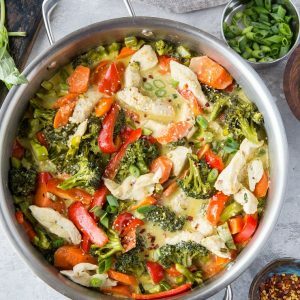 Lightning quick 30-Minute Chicken Green Curry is an amazing, healthful weeknight meal worthy of putting on repeat. All it takes is 7 basic ingredients to make this gem! If there’s one type of dish I can consume on repeat, it’s curry. This probably doesn’t come as a shocker given the plethora of curry recipes I’ve posted on this site. Nevertheless, I thought I would show you one of the easiest peasiest ways of making chicken green curry that I could possibly drum up in my noggin. Because you can never have too many curry recipes at your disposal. No way, no how! My secret to super easy curry is simply using store-bought curry paste. This may seem like the easy way out or completely inauthentic, but haste. Curry paste not only makes curry prep so much quicker and easier, but if you read the ingredients on the back, it’s all clean whole food ingredients. Sure, grinding whole spices to make your own spice blend is badass, and using fresh herbs and chilies is bangarang, but if we’re making a weeknight curry after a long day of work? Curry paste to the rescue. Open up a can of full-fat coconut milk (I use organic coconut milk that doesn’t include any gums or emulsifiers). Pour a small amount of the coconut milk (about 3 to 4 tablespoons) into a skillet and heat it to medium. You’re using the coconut milk just like you would oil…pretty cool, huh? Saute the ginger and veggies in the coconut milk. While the vegetables are sauteing, heat a small amount of coconut oil or avocado oil in a separate skillet. Use this skillet to brown the chicken. Why do I brown the chicken in a separate skillet? Chicken leaches a lot of liquid while it cooks and makes curry grainy if you add it right in. Cooking it separately and straining off the liquid ensures your curry is silky-smooth and luscious! You don’t need to cook the chicken all the way through in this step…you simply are looking to get the liquid out. Once you have browned the chicken, strain the liquid from it (I strain the chicken into a colander) and add it to the skillet with the vegetables. Add the remaining ingredients for the curry, then bring curry to a full but gentle boil. Cook 15 to 20 minutes, stirring occasionally, until curry has thickened and chicken is cooked through. Serve curry with choice of rice, cauliflower rice, spaghetti squash, zucchini noodles, etc! The way the recipe is written, this curry turns out mild. If you are sensitive to spice, you can add even more coconut milk or decrease the amount of green curry paste you use. Do not include the red pepper flakes if you prefer your curry mild. On the flip side, you can add red Thai chilies, red pepper flakes, or more green curry paste to make this curry spicier. If you tolerate onions and garlic well, add ½ yellow onion and 3 to 5 cloves garlic. Replace chicken with beef, pork, salmon, or shrimp. Use red curry paste or yellow curry spice blend in place of the green curry paste to change up the type of curry. Add or omit any of the vegetables. Cauliflower, bok choy, or potatoes are great additions or substitutions. Looking for a spicier curry? Add 1 red Thai chili, serrano or habanero, or add red chili sauce (like sriracha) to taste. 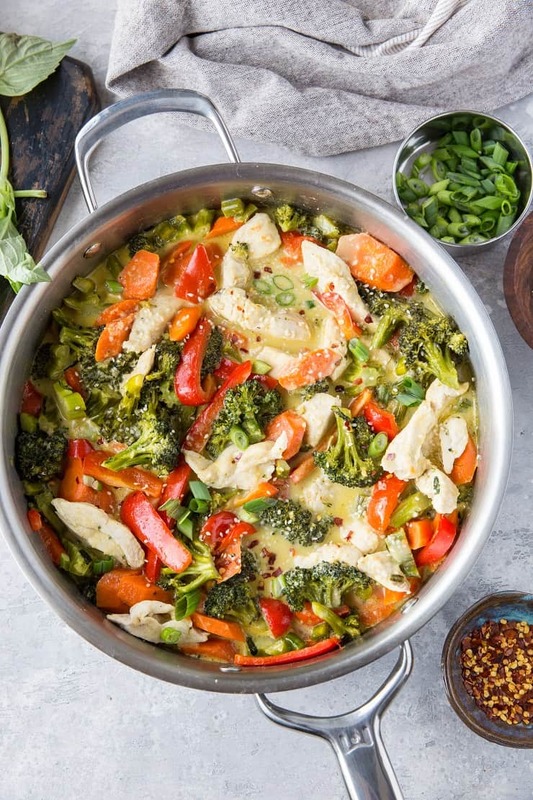 If you make this Chicken Green Curry, please feel free to share a photo and tag @TheRoastedRoot on Instagram! 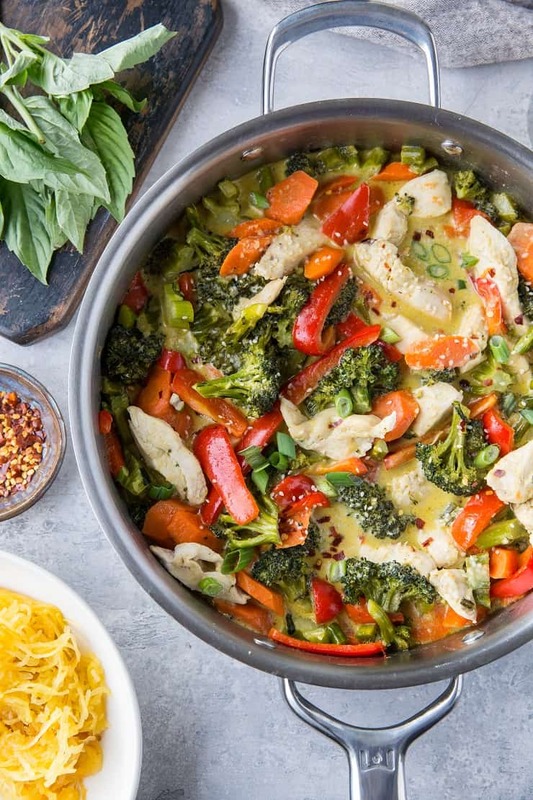 So now you have your chicken green curry in a hurry! Make it any night of the week and enjoy! Pour 1/4 cup of the coconut milk into a large skillet and heat over medium. Add the ginger, carrots, bell pepper, and broccoli. Cover and cook, stirring occasionally until vegetables begin to soften up, about 3 to 4 minutes. In a separate skillet, add a small amount of cooking oil (I use coconut oil) and heat to medium. Add the chopped chicken and sprinkle liberally with sea salt. Cook, stirring occasionally, until much liquid has seeped out of the chicken, about 5 minutes (note: you do not need to cook the chicken through, just until much of the liquid has cooked out). 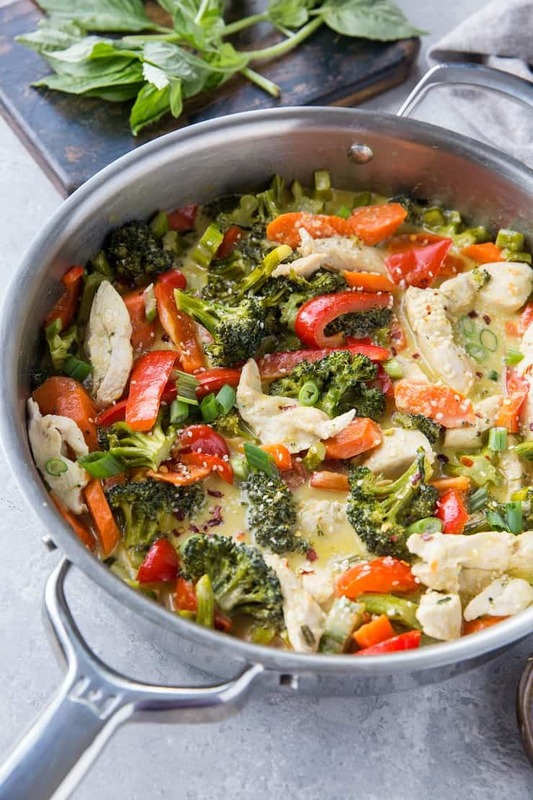 Strain the liquid from the chicken and add the chicken to the skillet with the vegetables, along with the remaining coconut milk and curry paste. Stir well, cover, and cook 10 to 15 minutes, until chicken has cooked through and vegetables reach desired done-ness. 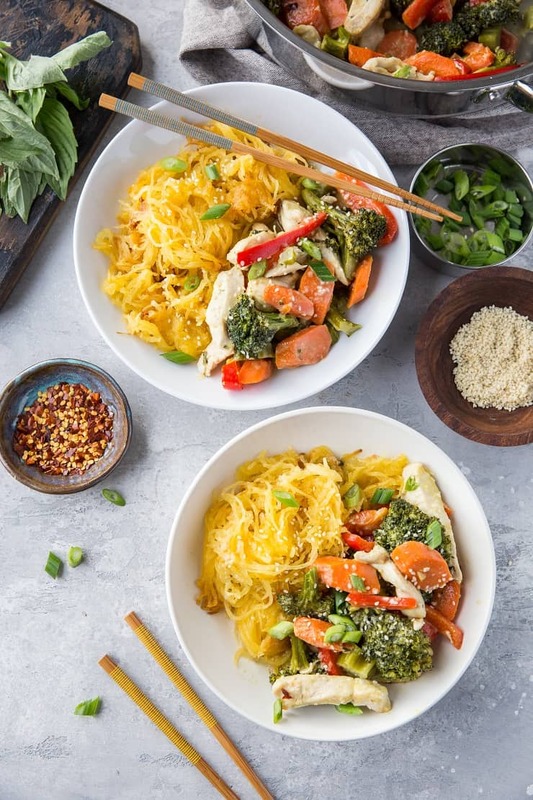 Serve curry with choice of rice, zucchini noodles, spaghetti squash, etc. That looks very spicy. Did you add coconut milk to the dish? The curry turns out mild. You can always add more coconut milk if you’d like, but I assure you it isn’t overly spicy 😀 Hope you enjoy!